A U-2 spy plane was mocked up with NASA information to back up a CIA cover story explaining the presence of a plane over the Soviet Union. 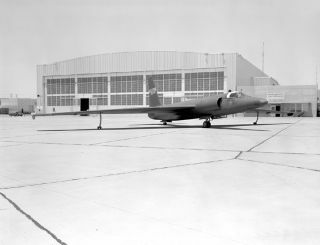 In this historical photo from the U.S. space agency, a U-2 spy plane with ficitious NASA markings sits at the NASA Flight Research Center at Edwards Air Force Base on May 6, 1960. After Francis Gary Powers was shot down over the Soviet Union during a CIA spy flight on May 1, 1960, NASA issued a press release with a cover story about a U-2 conducting weather research that may have strayed off course after the pilot reported difficulties with his oxygen equipment. To bolster the cover-up, a U-2 was quickly painted in NASA markings, with a fictitious NASA serial number, and put on display for the news media at the NASA Flight Research Center. The U-2 cover story in 1956 was that it was an NACA plane to conduct high-altitude weather research. But various observers doubted this story from the beginning. Certainly the Soviets did not believe it once the aircraft began overflying their territory. The NASA cover story quickly blew up in the agency's face when both Gary Powers and aircraft wreckage were displayed by the Soviet Union, proving that it was a reconnaissance aircraft. This caused embarrassment for several top NASA officials.